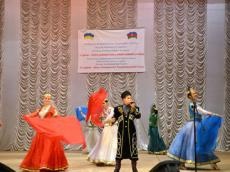 The All-Ukrainian Festival of the Azerbaijani Creative Groups has given a gala concert to mark the World Azerbaijanis` Solidarity Day at the National Tchaikovsky Academy of Music in Kiev. The concert was supported by Azerbaijani embassy in Ukraine, the Ministry of Culture and Tourism of Ukraine, the Congress of Azerbaijanis of Ukraine and the Azerbaijani Cultural Center after Muslim Magomayev. The event brought together officials of the Azerbaijani Embassy, representatives of the diplomatic corps, diaspora and cultural figures. Speaking at the event, Azeri ambassador Eynulla Madatli briefed the participants on history of the Day of Solidarity of World Azerbaijanis. He praised national leader Heydar Aliyev`s role in developing Azerbaijan`s statehood. The diplomat also stressed President Ilham Aliyev care and attention to Azerbaijanis of the world. The gala concert featured the performances of creative groups and singers.